Sabrina McGill (age 13) is the winner of the 2009 Youth Champion of Champions competition sponsored by the American Association of Philatelic Exhibitors (AAPE). The event was held in conjunction with the National Topical Stamp Show, a World Series of Philately exhibition held in Dayton, Ohio, June 12-14, 2009. The Championship, which is underwritten by a grant from World Columbian Stamp Expo, is directed by Robert and Carol Barr of Downers Grove, Illinois. Sabrina�s exhibit, "Zoofari", represented the Plymouth Show 2008, where she had won the AAPE Youth Grand Award. "Zoofari" is an imaginative safari of various continents including Africa, Asia, and North America. This was Sabrina�s fourth year as a competitor, and her first year to win the championship. She has been mentored and encouraged in her philatelic journey by two aunts and by other members of the Indiana Stamp Club. The 2009 competition included fourteen exhibits (32 frames) prepared by youth aged 9 � 16; half of them were competing for the first time. Winners of AAPE Youth Grand Awards from nationally accredited shows in the U.S. and Canada vied for the designation "Youth Champion of Champions" and for many other donated awards. In recognition of their high level of achievement, all participants received Fran Jennings medals, co-sponsored by the Postal History Foundation and AAPE, and membership in Young Stamp Collectors of America, donated by Ken Martin, as well as Merit Certificates and ribbons. Youth Champion of Champions - the best youth exhibit shown in North America in 2008-2009. Donated by WESTPEX. Winner also received Ken Lawrence framed stamps and the Herndenberg stockbook award. Presented to Sabrina McGill (13), representing Plymouth Show 2008, "Zoofari." Reserve Champion � runner-up to the Champion of Champions. Donated by WESTPEX. Presented to John Phillips (13), representing St. Louis Stamp Expo 2009, "Faces and Places of the Civil War." Welsh Philatelic Society Postal History Award � for the best postal history exhibit. Donated by Ann Triggle. Presented to Adam Mangold (9), representing Philadelphia National Stamp Exhibition 2008, "We the People." Howard Hotchner Award - for the best portrayal of American History. Donated by John Hotchner. Presented to John Phillips (13), representing St. Louis Stamp Expo 2009, "Faces and Places of the Civil War." ISWSC Award � for the best use of worldwide stamps and material. Donated by International Society of Worldwide Stamp Collectors. Presented to Trevor Thomas (11), representing ROMPEX 2008, "The Game of Soccer." American Topical Association Youth Award - for the best topical/thematic exhibit. Donated by ATA. Presented to Sabrina McGill (13), representing Plymouth Show 2008, "Zoofari." A) NAPEX Title Page Award - Presented to Sherri Biendarra (16), representing MILCOPEX 2008, "The Olympics � Let the Games Begin." B) NAPEX Creativity Award - Presented to Philippe Talarico (13), representing Royale 2008, Quebec, "Musical Instruments." C) NAPEX Topical Award � Presented to Jenna Smith (10), representing the Minnesota Stamp Expo 2008, "Man�s Best Friend: Recognized Breeds of the American Kennel Club." D) NAPEX Thematic Award � Presented to Lorah Wilson (13), representing VAPEX 2008, "Animals Around the World." E) NAPEX Research Award - Presented to Caleb Hall (15), representing Filatelic Fiesta 2009, "The Formation of the United States." A) WESTPEX Write-up Award � Presented to John Phillips (13), representing Southeastern Stamp Show 2008, "The Game of Chess." B) WESTPEX Flora and Fauna Award - Presented to Cassandra Stahl (13), representing INDYPEX 2008, "Panda." C) WESTPEX Award of Excellence � Presented to Sabrina McGill (13), representing Plymouth Show 2008, "Zoofari." D) WESTPEX Judges' Choice Award - Presented to Alyssah Xeniah C. Alcala (15), representing Ameristamp Expo 2009, "Her Majesty Queen Elizabeth II." APS Membership Award - Donated by Ken Martin - Presented to Nick Hall (12), representing OKPEX 2008, "Wheels of Freedom." ATA Membership Award � Donated by Johnstown Junior Stamp Club - Presented to Philippe Talarico (13), representing Royale 2008, Quebec, "Musical Instruments." The Caring Award in memory of Chris Winters, MD - Donated by the Pinnacle Stamp Club, Little Rock, Arkansas. - Presented to Sherri Biendarra (16), representing MILCOPEX 2008, "The Olympics � Let the Games Begin." Potentiality Memorial Awards in memory of Sid Nichols and Chet Allen - Donated by the Pinnacle Stamp Club, Little Rock, Arkansas. - Presented to Adam Mangold (9), representing Philadelphia National Stamp Exhibition 2008, "We the People" and Presented to Lorah Wilson (13), representing Stampshow 2008, "Creative Characters." Unique Girl's Award - In memory of Sandy Morris. - Presented to Jenna Smith (10), representing the Minnesota Stamp Expo 2008, "Man�s Best Friend: Recognized Breeds of the American Kennel Club." 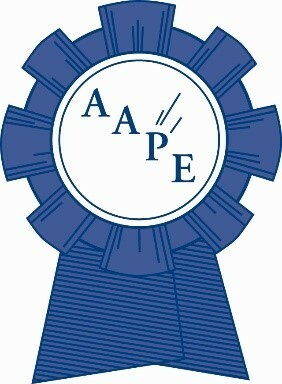 AAPE is indebted to the many generous donors (both individuals and organizations) who have made these awards possible. Thank you very much for your support of our aspiring youth exhibitors! More information about the youth championship program may be found at http://www.aape.org/youth_main.asp.